Ireland – A Racist State? This week we come face to face with a particular reality that again causes us to pause and ask whether the Irish state is, by its very nature, racist. In two separate incidents, Gardai removed blond children from their Roma parents because, as RTE reported, their “features, blond hair and blue eyes, contrasted with the other children in the family”. The removal was carried out without any actual evidence of risk to their health or welfare, a clear mandate of Section 12 of the Child Care Act. Despite the absence of harm, and contrary to a backlog which has seen 4,100 children assessed by the HSE as needing intervention having to wait more than three months, this intervention was fast-tracked by the HSE. So what happened? It appears that the state intervention was launched as a result of an overtly racist message on the Facebook page of TV3 reporter Paul Connelly. That an investigative journalist who had reported on the Roma community in the past (albeit in a reductive and harmful manner) was unaware of the possibility that some could be fair skinned is strange. That a statement like “the Roma’s robbing them to get child benefit in Europe” did not immediately trigger alarm bells that the poster was racist, simply beggars belief. It is telling that TV3 chose to blur out that line when discussing the case with Connolly. Were they concerned that their witness might appear like an unreliable bigot, or was this a genuine attempt to avoid misrepresenting the Roma community, while continuing with their own racist witch-hunt? 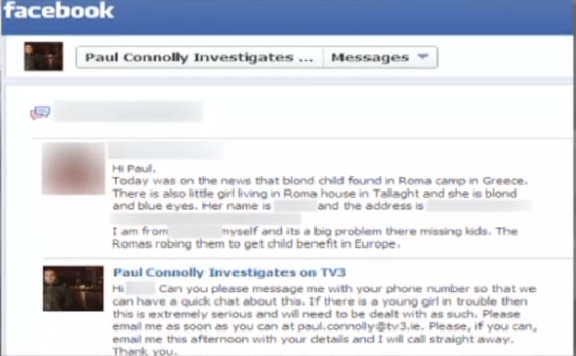 Were Paul Connolly to “investigate” alone, it would suggest an attitude towards the Roma community that was predisposed. But the real story here is how State agencies – the HSE and An Garda Siochana – stepped in and fast-tracked a DNA test for their mate, seemingly buying in to the vicious myth of the child snatchers. Their actions, and the media’s coverage of their actions up until the point where DNA samples proved positive, suggests a widespread and deep-seated set of racist beliefs. We take this up the issue of state racism in our interviews with Shane O Curry and Ronit Lentin where we explore Ireland’s abysmal record in its interactions of migrants who are considered ‘non-white’. We spoke to Shane O Curry Director of ENAR Ireland, a national network of anti-racism organisations. Shane outlines the reality of racism in Ireland today in the face of official denial. Through the Ireport.ie initiative, which enables easy and safe reporting of racist incidents, ENAR Ireland continues to the challenge this denial by presenting verifiable evidence. He describes Ireland as a “rogue state” in terms of official policy around racial profiling, which at present is not outlawed but instead supported by the state, contrary to a multitude of international agreements at UN and EU level that seek to tackle institutional racism. He also outlines how in 2013 Ireland has no national strategy or plan to tackle racism. He points out that An Garda Siochana are immune from the limited equality legislation that purports to tackle racism. ENAR Ireland describes this legislation as ‘unworkable’ citing that it has seen less than one person a year prosecuted for racist crimes as actual number of racist incidents reported continues to rise. Ronit Lentin, Associate Professor of Sociology in Trinity, argues that state nation states are by their very nature racist. She challenges the myth that Irish people are not racist. She talks about Irelands’ long and shameful history in its treatment of migrant since the states inception, including even those invited as programme refugees. She highlights how interactions with government ministers left her in now doubt that many politicians genuinely believed their own racist hype about some groups of migrants. She tell us of conversation with Michael Martin, present leader of Fianna Fail whilst sharing a panel on a TV show around the time of the change of citizenship referendum. She was dumbfounded to hear Martin relay a story how he heard that a Nigerian woman was expecting 4 children, claiming that she had one baby in Nigeria and then, whilst still in labour, boarded a plane and came to Ireland to have the other three. The history of this island shows that state abuses can easily be internally and communally denied. This need not be the case though. Specific moments of forced common reflection also afford the motivation and opportunity for people to work together to consciously reshape those cultural norms and directly challenge abusive state power. The death of Savita Halappanavar, largely attributable to cultural practices directly associated with the historical oppression of women by the Irish state, was one such incident. The response of her death has seen waves of popular revulsion growing into coherent social movements around reproductive justice. Let’s hope that a similar wave, led by the excellent representatives of Pavee Point and the Irish Traveller’s Movement, might emerge from this vicious, shameful affair.